Favor forgiveness over frustration the next time your Vienna beef arrives without celery salt, neon green relish, or another signature ingredient. The long list of food vendor worries extends far beyond ensuring that they have the requisite nine ingredients to drag your dog through the garden. The Chicago-style hot dog is just one of many attractive food offerings that draw people to our city. That’s in part because food service is a popular entree into business for those who don’t speak English. And understanding how the city classifies you—for example, as mobile food dispenser versus a mobile food preparer—is just one hurdle to overcome. Business owners must gather multiple documents, work through multiple processes, interact with multiple agencies, and apply for licenses, certificates, permits, and more. In some cases, other licenses or certificates are prerequisites. Municipal codes state what you can and can’t do, but not how to go about the process correctly. To clarify these complexities, ID professor Tomoko Ichikawa’s Communication Design Workshop partnered with the Chicago Food Policy Action Council. 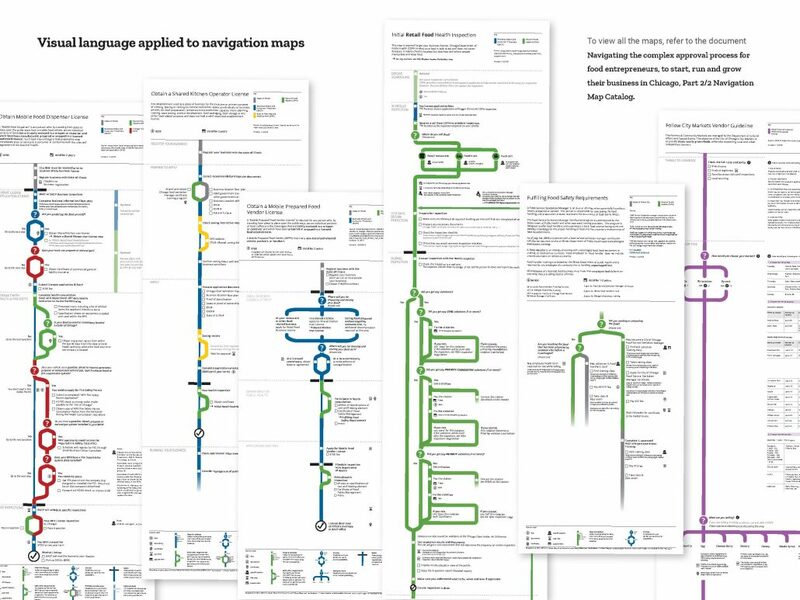 ID students worked to convert the city’s text-heavy instructions into visualized maps that help business owners navigate the process. Students interviewed business owners, their consultants and support organizations, as well as city officials. They gained a fuller understanding of the current situation, the aspirations of food entrepreneurs and the conflicts that they experience, and city requirements and initiatives. The class also benchmarked efforts and practices of other cities. 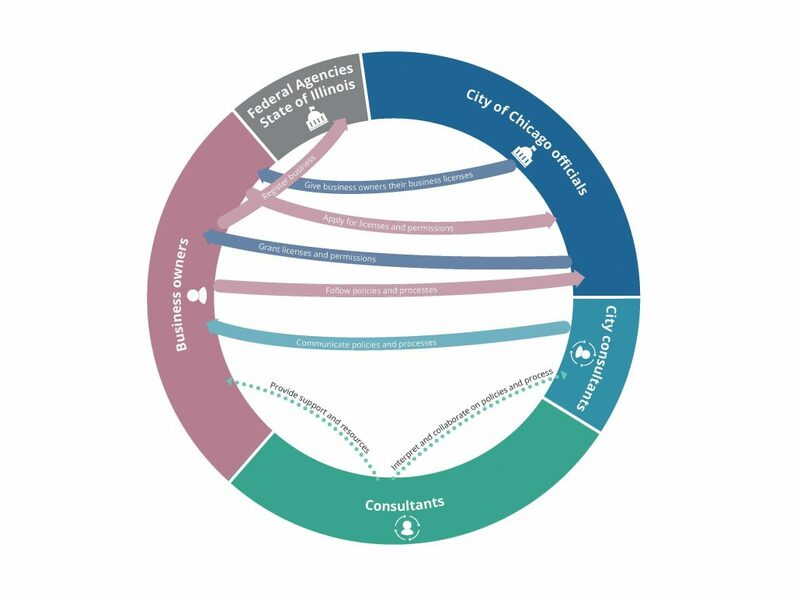 Ten approval processes were visualized into navigation maps, ranging from licenses and certificates to guidelines and registrations. Students identified commonly occurring aspects of the various processes to develop the basis of a visual language. In addition to the visual syntax and semantics of the process, the issue of how a business owner could understand which license to apply for became evident. For instance, wanting to sell muffins could take various forms, each requiring different types of approval. A logic flow emerged which resulted in a decision-making tree that would help owners decide which license to apply for based on their specific business variables. The interviews yielded information that went beyond the topic of acquiring licenses to conduct business. First, by understanding the relationships between the various entities in the food entrepreneurship ecosystem, students revealed the perspectives of various stakeholders. This shed light on the dynamics, alignment, and tensions that exist in this system. 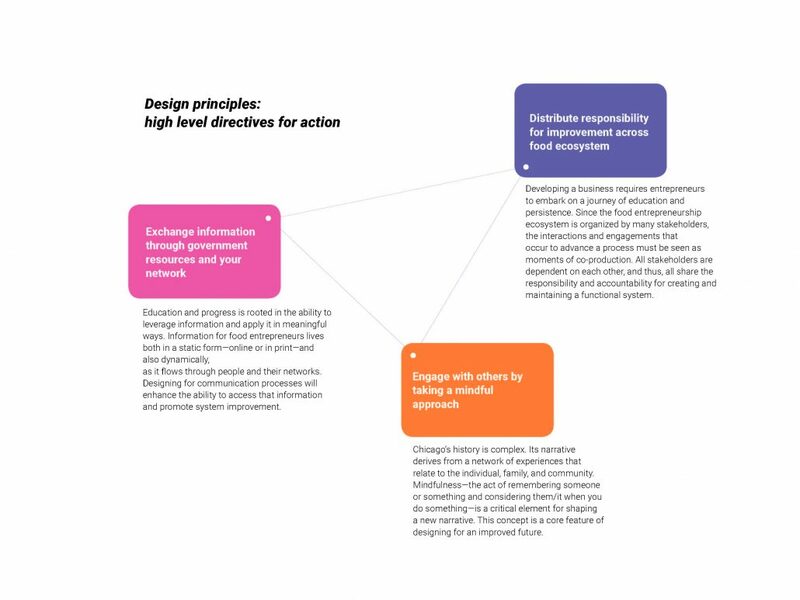 Secondly, students uncovered higher level conceptual understandings of key user needs that resulted in design factors and principles that can assist to direct future design interventions. The resulting work was delivered in a final interactive session with various stakeholders, presented in English and Spanish, along with two documents: a Project Report and a Navigation Map Catalog. You can find these here as PDFs. The work done in this class is continuing. 14th Annual Chicago Food Policy Summit: ID students participated in the Food Business Clinic on February 15, 2019. Presentation to the City of Chicago: We are hoping to present our work to the Department of Business Affairs and Consumer Protection (BACP), the main city agency that grants business licenses. Translation into Spanish: We are in the process of making our navigation maps accessible to Spanish-speaking entrepreneurs in Chicago.